Dating at least as far back as the time of the Ancient Egyptians, flatbread has been a culinary staple for millennia with cultures ancient and modern putting their own distinctive twist on this most versatile of breads. 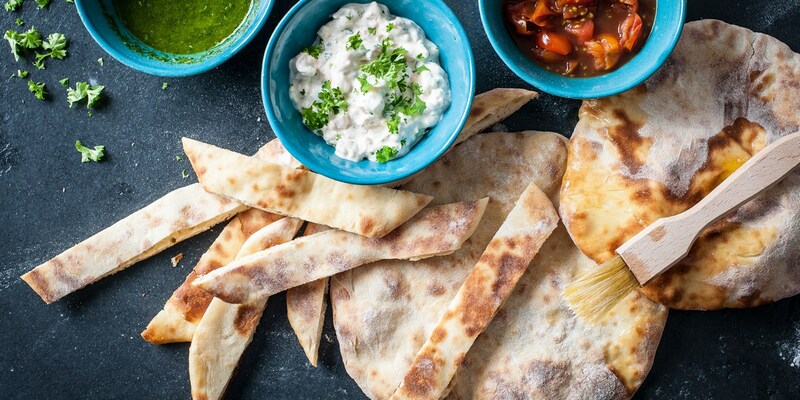 Flatbreads, commonly unleavened and simple to prepare, are the perfect base for a variety of delicious recipes and can be served plain or enhanced with spices and other fresh flavours. Chris Hruskova’s Spelt and rye flatbread recipe makes a wonderful, rugged addition to any good cheese board, while Adam Gray’s Flatbread recipe demonstrates the glorious simplicity of the bread, pairing it with a variety of different dips. Alternatively for a bread packed with enough flavour to stand up on its own, try Pete Bigg’s Bacon and cheddar flatbread. This easy bread recipe is packed with cheese, herbs and bacon, perfect for serving with soup or alongside some simply prepared seafood.